the message appears when i leave in blank a required input. Can you please try it again if the issue still persist? But, please make sure to fill on all required fields. Yes, you are correct. 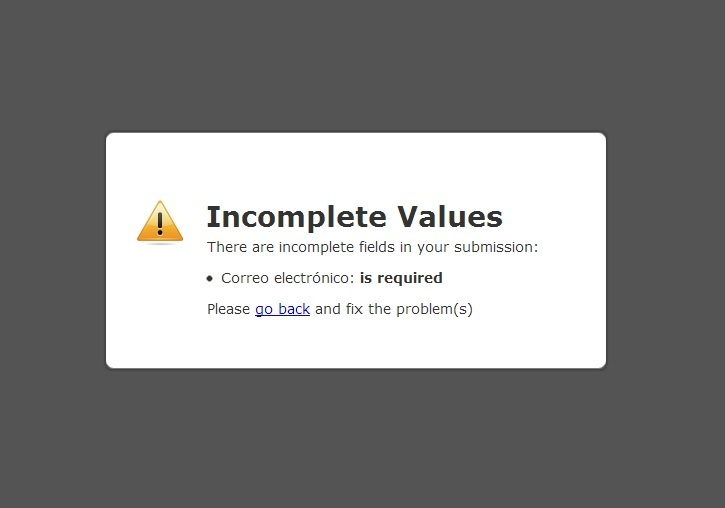 The form works perfectly if you fill in all the required fields, however, the error appears when you do not fill in a required field. I am attaching an image of the message that should be appearing instead of the error that I mentioned previously. I see what you mean. These types of issues are usually caused by conflicts between pre-existing scripts on the page and those of the form. Replacing the form code with its iFrame equivalent should fix the problem. Please let us know if it does. The problem has been solved as you mentioned. But now we have an issue the frame does not grow verticaly when the css for the required inputs are shown on the screen. Please try setting your form or Iframe embed code height to 709px. If i put a div e.i. You do not need to enclose the iframe embed code inside a DIV tag. Try removing the script and use the embed code below. Thank you so much, I am aware that I am not supposed to add the div, I simply added it to show you up to what point the iframe would appear. Since the beginning I had the height set to 709px in my code, but the script would modify it automatically. Nevertheless, you gave me the solution in your response, the solution was to eliminate the script that jotform gave me; I removed it and now everything is perfectly visible with the 709px height. The problem is that this is a temporary solution, because I do not want the height to be a fixed height. I want it to measure 519px when it opens, but for it to extend to 709px when the required fields are not filled in. This is so that there will not be a white space between the form and the footer. I have already tried with min-height and max-height, but this does not work. I do not know what other way I can do this.